So basically, we all want to lose weight without having to actually get up and go to a gym! I really wish I had the motivation (or the time) to get into a good workout routine and actually enjoy it. Although, I also wish I had the will power to say no to sweets and crisps every night. Can't have it all can we! Body wraps have been around for a while in salons, which offer a quick fix to those wanting to lose weight the easy way. 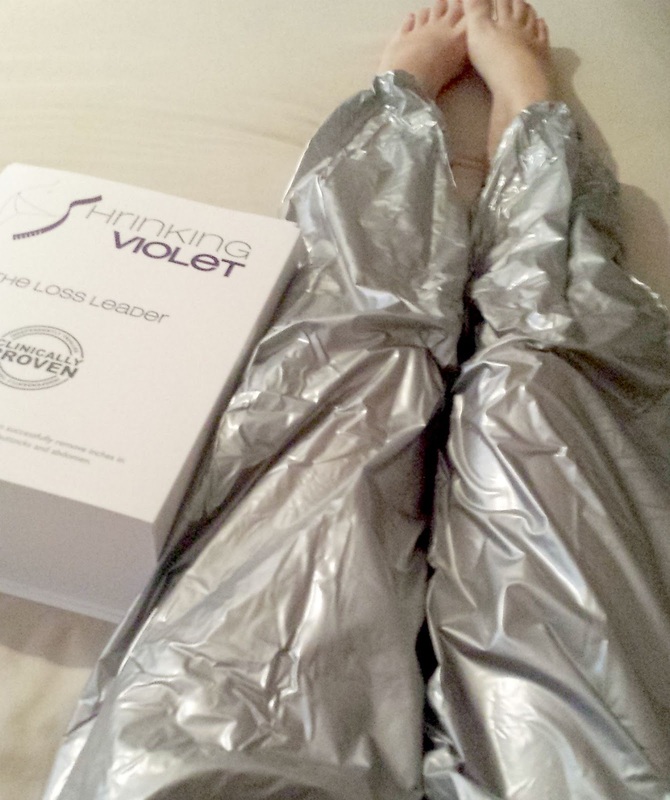 When I was contacted by the lovely people behind the Shrinking Violet brand on Twitter (@GetShrinking) asking if I would like to trial their new at-home kit, I jumped at the chance! (ooh see, a bit of exercise there). 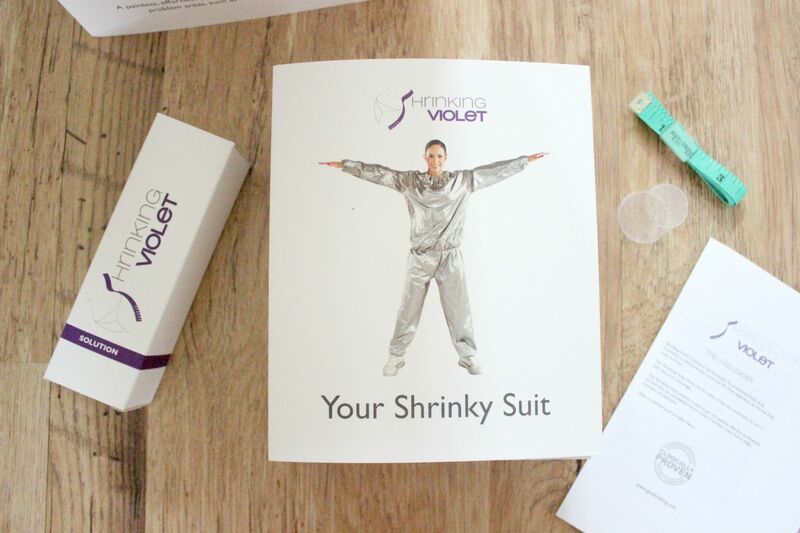 The Shrinking Violet At Home Kit* contains an oil based solution, a measuring cup, a tape measure and a very sexual astronaut-type 'Shrinky Suit'. 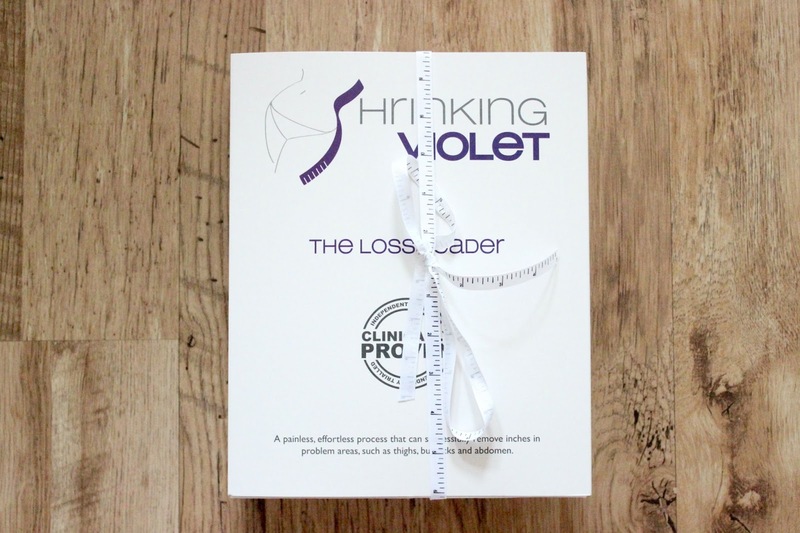 The kit boasts that you could lose up to 2 inches in problem areas such as abdomen (my main issue after 2 babies), thighs, arms and bum. The magic oil contains a mix of essential oils and active ingredients which help to break down fat. The purpose of the suit is to slightly raise body temperature and allow the solution to get to work and increase the production of sweat (nice) in order to release the bad toxins in the body. It's so simple to use. You just measure one 25ml cup of the solution and apply to any problem areas, pop on the suit and go about your business for an hour. You can even work out in the suit if you wanted. I pottered around upstairs for an hour when I had mine on. They advise not to shower or do any heavy exercise for 12 hours after you've worn the suit, just to give the solution the chance to really soak in and work it's magic. I measured myself before and then 24 hours later I measured myself again and was quite surprised by the results..
How amazing is that! After just ONE go! I'm gonna use it once a week and try and cut down on the sugary snacks and just see how much I can lose.